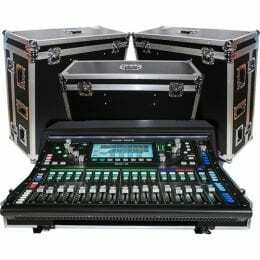 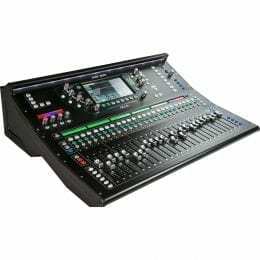 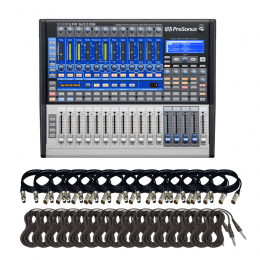 PreSonus StudioLive AR22 USB 22-Channel Hybrid Performance and Recording Mixer + Rockville RXS20 Portable Mixer Stand and (16) XLR to XLR Cables 15FT Ea. 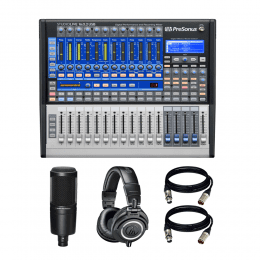 PreSonus StudioLive AR22 USB 22-Channel Hybrid Performance and Recording Mixer + KRK RP5G3 Rokit 5 Generation 3 Powered Studio Monitor, Black, Pair and Cables. 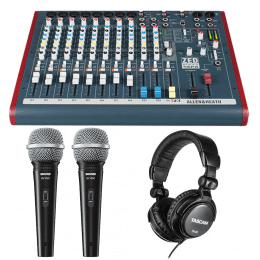 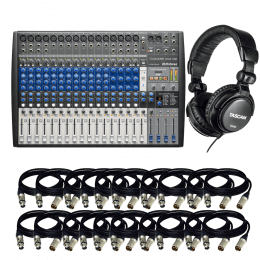 PreSonus StudioLive AR22 USB 22-Channel Hybrid Performance and Recording Mixer + Tascam TH-02 Studio Headphones (Black) + (22) XLR to XLR 15FT Ea. 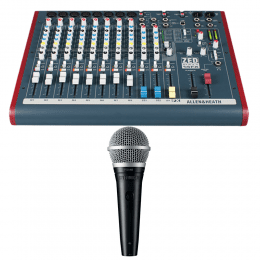 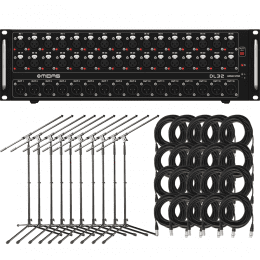 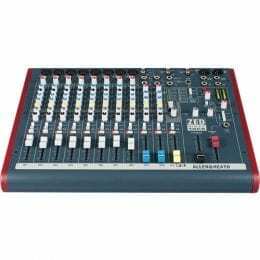 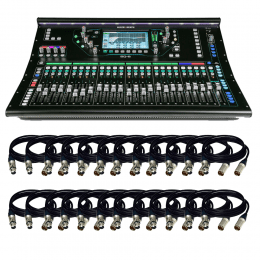 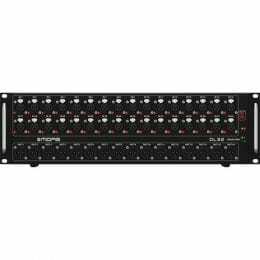 Allen & Heath SQ-6 48-Channel / 36-Bus Digital Mixer with 24+1 Motorized Faders & (32) XLR to XLR Cables 15FT Ea. 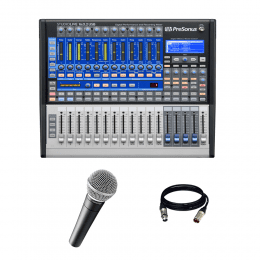 PreSonus NSB 8.8 – 8 x 8 AVB-Networked Stage Box & (2) Shure SV100-W Dynamic Cardioid Handheld Microphone + (4) Mircrophone Stand and (4) XLR to XLR 15FT Ea. 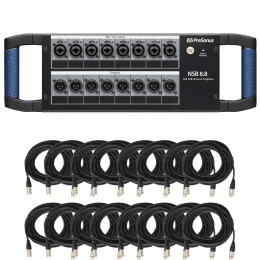 PreSonus NSB 8.8 – 8 x 8 AVB-Networked Stage Box & (16) XLR to XLR Cables 15FT Ea. 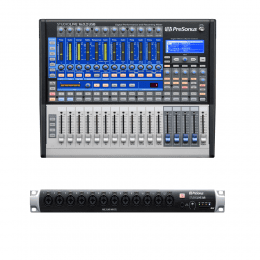 PreSonus StudioLive 16.0.2 USB Performance & Recording Digital Mixer + Shure SM57-LC Microphone and Cables. 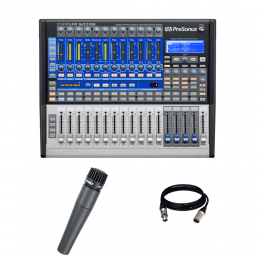 PreSonus StudioLive 16.0.2 USB Performance & Recording Digital Mixer + Shure SM58-LC Vocal Microphone and Cables. 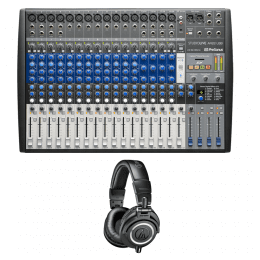 PreSonus StudioLive 16.0.2 USB Performance & Recording Digital Mixer + Audio-Technica AT2020 Cardioid Condenser Microphone + Audio-Technica ATH-M50x Monitor Headphones (Black) and Cables. 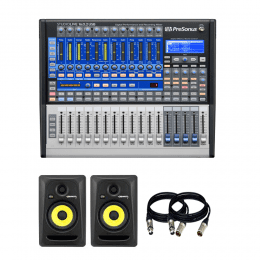 PreSonus StudioLive 16.0.2 USB Performance & Recording Digital Mixer + KRK RP5G3-NA Rokit 5 Generation 3 Powered Studio Monitor – Pair + (2) XLR to XLR Cables 15FT Ea. 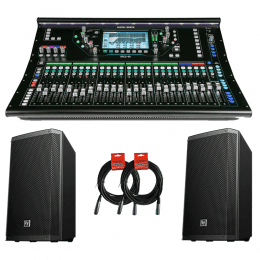 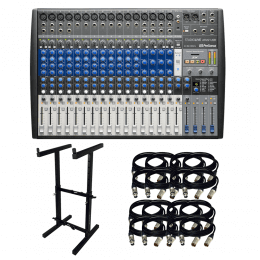 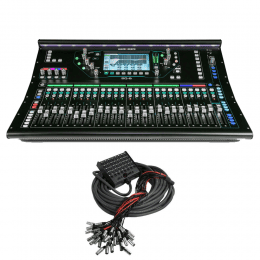 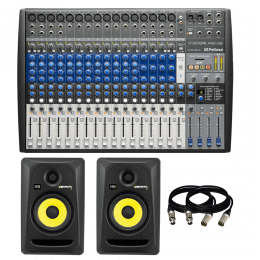 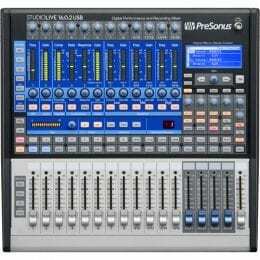 PreSonus StudioLive 16.0.2 USB Performance & Recording Digital Mixer + (16) XLR to XLR Cables 15FT Ea. 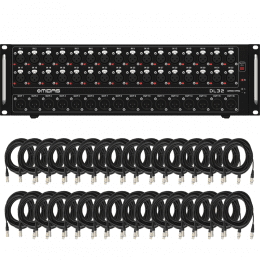 and (16) TRS to TRS Cables 15FT EA. 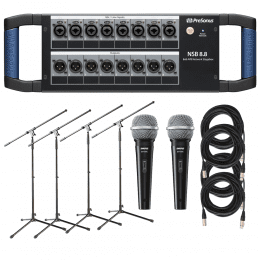 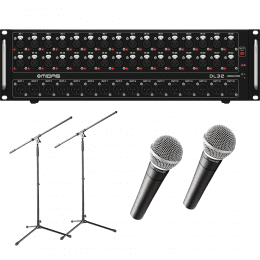 Midas DL32 – 32-Input / 16-Output Stage Box with 32 Midas Mic Preamps & (10) Mic Stand with Fixed Boom Black & (20) XLR to XLR 15FT Ea. 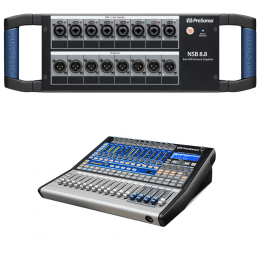 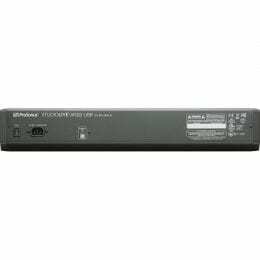 Midas DL32 – 32-Input / 16-Output Stage Box with 32 Midas Mic Preamps & (10) Shure PGA48 Dynamic Vocal Microphone (10) XLR to XLR 15FT EA. 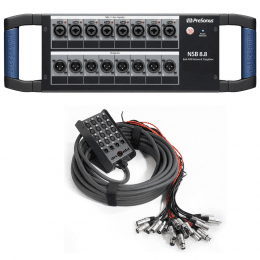 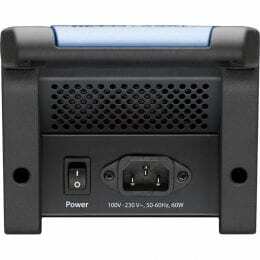 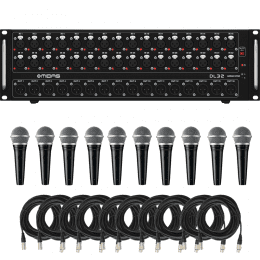 Midas DL32 – 32-Input / 16-Output Stage Box with 32 Midas Mic Preamps & (32) XLR to XLR Cables 15FT Ea.